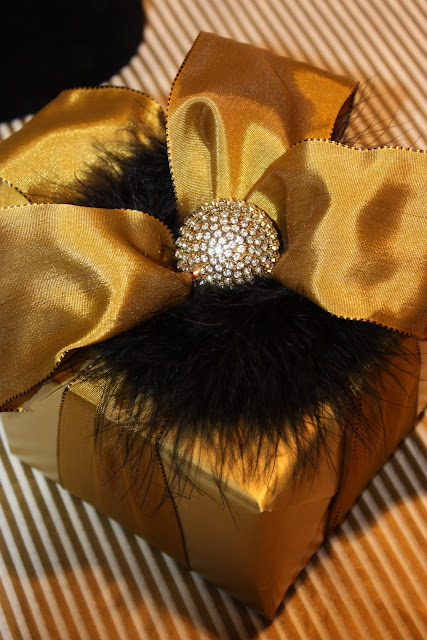 This gift is so beautiful and I love the glamorous and sophisticated look of black and gold...and I really like little hints of black along the edge of this ribbon. I always enjoy seeing how people repurpose things and this faux fur scrunchie looks like a black powder puff! Very resourceful and pretty! I would be proud of this package! I wouldn't want to unwrap it... it's so elegant! 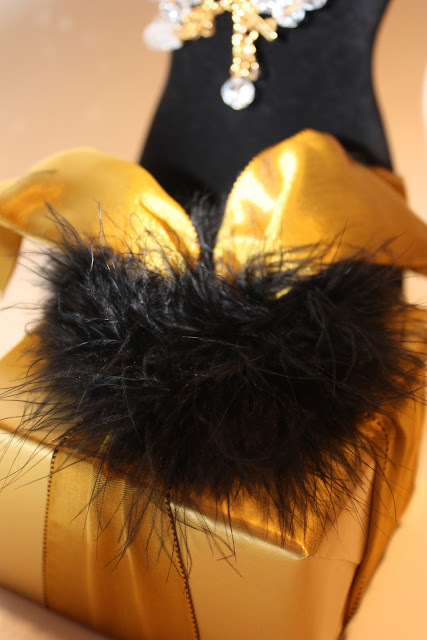 Very very Parisian - I would love to receive and unwrap this gift as there will be something equally exquisite inside!! Sande you're such an inspiration! So beautiful, Sande. 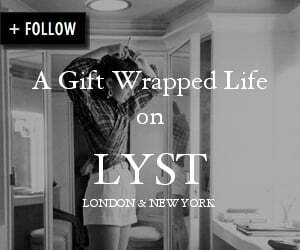 Thank you for sharing such beautiful gift wrap. I love this look. I might not look at feather scrunchies the same way again. 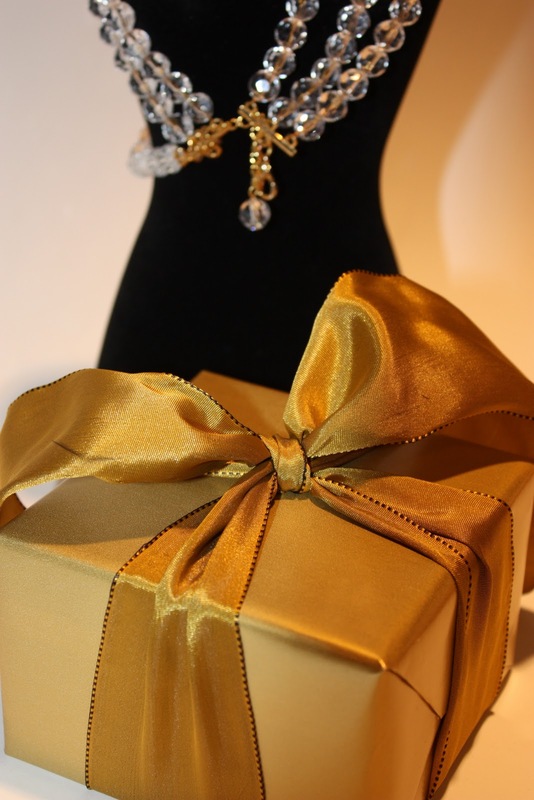 Tres elegante ~ with exquisite ribbon and I so love the gorgeous bauble ~ you have done well . 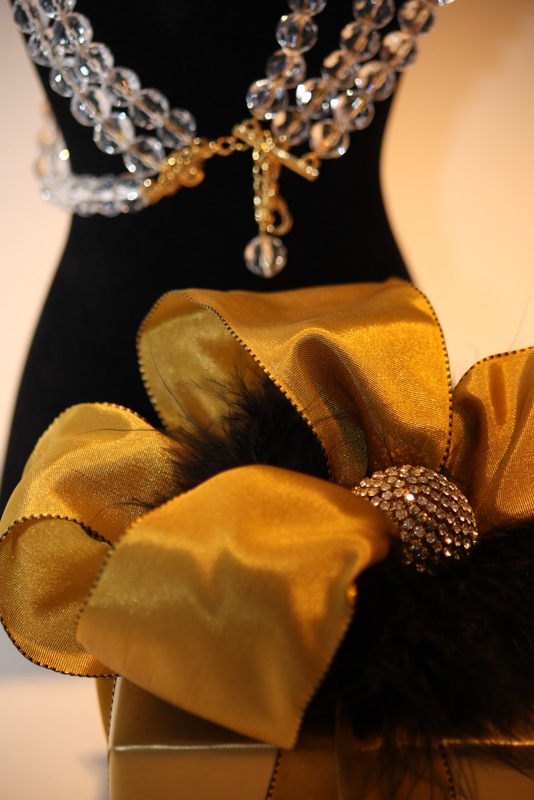 This is a fantastic look....I love the touch of "bling"....glamorous gift!!! I love the idea of using a hair scrunchie...I've never attempted that technique. The package looks very elegant! Love the scrunchie...is it marabou? 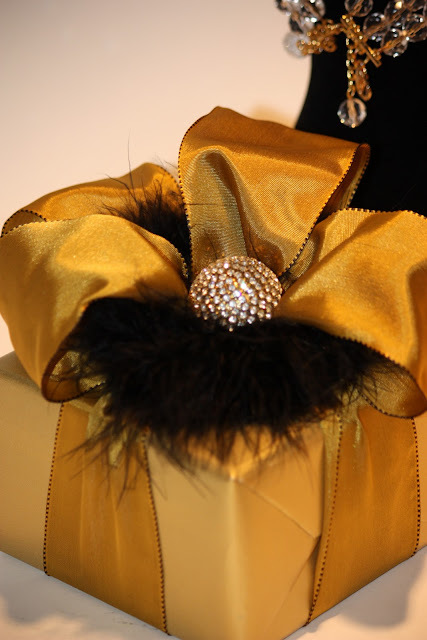 I have used white marabou trimming tops of white gift bags with white tissue paper. This was something I used in my antique booth; when you purchased something from my booth, which had lots of white, silver and gold at the time, you got a special gift bag to put it in! No one else in the store was doing anything like that at the time, everyone loved it! Also, what a great way to use onesy earrings...can't find the partner, etc. Thanks for your comment on my post today, I just added you to the photo credits, I missed doing that yesterday! Sande you have inspired me to dash down to the haberdashery store and buy every single metre of gold ribbon and black marabou I can find! This is undeniably glamourous and wonderful - thank you for posting about it. Oh, it does look wonderfully glamorous and elegant. I agree, that bit of bling makes it sparkle. I would never want to open it. A perfect combination. Oh Sande, I think my eyes widened when I saw this. So glamorous and gorgeous.